The Santa Lucia Highlands of California’s Monterey County lies in what is often called ‘Steinbeck Country,’ named after the celebrated 20th-century writer, John Steinbeck. His novel, Grapes of Wrath, which was published in 1939 and won both a Pulitzer Prize and Nobel Prize, has become one of the most widely read and discussed novels on college campuses throughout the United States. The title is an indirect reference to a passage in the Bible (Revelation 14:19-20) that speaks to deliverance from oppression. The introduction of vinifera grapes in the Santa Lucia Highlands dates to the 1790s when Spanish missionaries arrived. In the early 1970s, the modern era of winegrowing began with the plantings of Rich and Claudia Smith at Paraiso, Nicky Hahn at Smith & Hook, the McFarland family at Sleepy Hollow, and Phil Johnson at La Estancia. Early growers often reached for high tonnage and sold their wine in bulk to other counties. 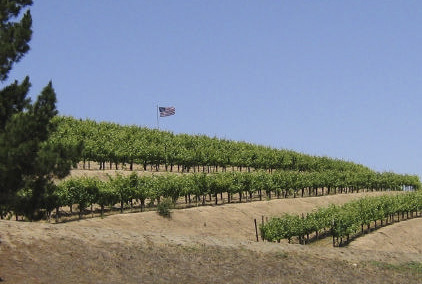 The Santa Lucia Highlands was designated an American Viticultural Area in 1991, and with this came an increased emphasis on premium Pinot Noir production. Currently, there are 4,700 acres of vineyards, primarily Chardonnay and Pinot Noir. A vineyard map is on page 3. The appellation is located 10 miles from Monterey Bay as the crow flies. The vineyards are planted on the southeast facing Santa Lucia mountains range looking out toward the Salinas River Valley. Vineyard elevations range from 200 ft. to 1,500 ft. above sea level. The soils are a combination of well-drained shallow sand and loam that possess poor fertility and cause the vines to struggle. Long summer days may reach over 80 degrees in temperature, but the evenings often swing into the high 40s. Gentle afternoon coastal winds toughen the grape skins, adding to flavor. Rainfall averages only 10-15 inches per year, so the vines are judiciously irrigated. Wineries and growers in the Santa Lucia Highlands appellation formed an organization in 2005: Artisans of Santa Lucia Highlands. Currently there are 29 member growers including Bianchi, Boekenoogen, Estancia, Fairview Ranch, Gallo, Garys’, Hahn Estates, Highlands Ranch, Hillside, Kelly’s, La Estancia, La Reina, Lucia Highlands, Manzoni, McIntyre Vineyards, Mer Soleil, Morgan Double L, Olson Ranch, Paraiso, Pessagno Vineyards, Pisoni, R&D, River Road, Rosella’s, Smith-Lindley, Talbott, Tondre Grapefield, Vine Monte Nero and Vinco. 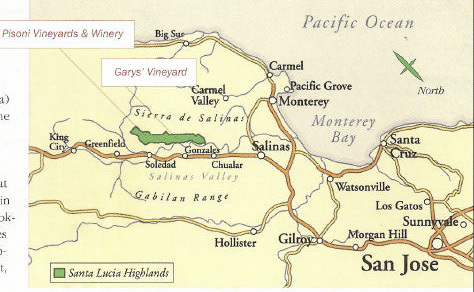 Many wineries who are outside the Santa Lucia Highlands source grapes from within the appellation including Arcadian, August West, Bernardus, De Tierra, Hope & Grace, Joulian, La Rochelle, Loring, Miner Family, Miura, Novy, Patz & Hall, Pelerin, Peter Michael, Pinder, Siduri, Sonnett, Testarossa, and Tudor. 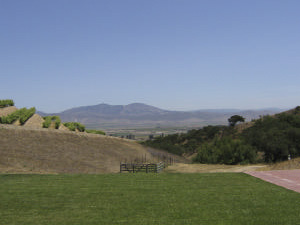 The official launch of the Artisans of Santa Lucia Highlands took place on Saturday, May 19, 2007, at Paraiso Vineyards. The media and trade were invited for an in-depth educational session examining the vineyards and personalities of the Santa Lucia Highlands appellation, a luncheon among the vines, and a tasting with the winemakers of the appellation. The public was treated to a tasting of the Santa Lucia Highlands wines later the same day. I could not attend as I was at the Anderson Valley Pinot Noir Festival the same weekend, so my friend, Laura Ness, covered the event and submitted the following report. Laura is a well-known wine writer who covers the Santa Cruz Mountains for Appellation America and serves on many tasting panels. Occasionally you will find her pouring Pinot at Burrell School Winery as well. While the Santa Lucia Highlands appellation has been in existence for over 15 years now, and has already garnered its fair share of acclaim as a Pinot Noir growing region, the winegrowers in these rugged mountains thought it might be a good idea to introduce themselves. Officially. They did so in a stylish and hospitable fashion befitting their homey and friendly nature on Saturday, May 19, at Paraiso Vineyards. Not only was the debut a chance for consumers and the trade to meet the local growers as well as the winemakers who are sourcing their fruit here, it was an opportunity to learn first hand the unique features of this winegrowing region. If you live in California and have traveled the Highway 101 corridor between San Jose and points south, say, Paso Robles or Los Angeles, you have passed through this vast agricultural region known as the Salinas Valley. Acres of brilliantly-colored baby lettuces shoulder up to bench lands bearing broccoli, cauliflower, cabbage and onions. It is truly the salad bowl of America. To the west, the hills rise up sharply, a windbreak to the Pacific Ocean that lies less than 15 miles away. From Highway 101, your eyes take you across fields of laborers, picking lettuce and tending to row crops. Up the hills, the grapevines begin, climbing up to elevations of 1,500 feet. The Santa Lucia Highlands appellation is distinctly drawn on the face of this mountain range. When you look at the outline, the sheer verticality reminds one of a ski resort map. From these steep hillsides, the view to the east is mesmerizing. The greens and yellows of the cropland and grassland sweep away from the river valley, becoming bleached and blond only to climb to yet another set of mountains to the east. There is almost no hint of civilization as most of us know it who live in the non-agrarian areas of California. Not a strip mall in sight. Not even a truck stop. At Paraiso Vineyards, where the inaugural Wine Artisans event took place, there is nothing but the sound of the wind, the endless waving of grasses, and the almost painfully beautiful blueness of the sky. The temperature is perfect. It is always perfect. Perfect for growing Chardonnay and Pinot Noir. Perfect for growing lettuce, apples, prickly pear cactus and asparagus. It makes me healthy just thinking about it. Imagine living in a place where the land you are standing on has changed few hands since the Spanish relinquished their stronghold upon losing the war. The sense of history, of continual connectivity to the land, is palpable. It is what makes this group of people so special, so congenial, so proud to share the bounty of their little piece of agricultural paradise. What exactly makes this land, this place, this terroir, so distinctive? Not content to simply say, “taste our dirt, please,” the Artisans of Santa Lucia Highlands Board of Directors invited two experts to speak to the primary factors that define the terroir of this region. Climatologist Dr. Mark Greenspan of University of California Davis and Dr. Alfred Case, soils scientist, both gave detailed and informative presentations that were convincing and educational. 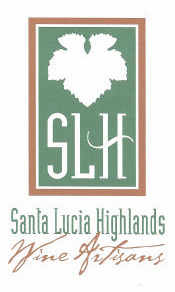 Their complete presentations will be posted on the Santa Lucia Highlands website (www.santaluciahighlands.com). Dr. Greenspan, an expert in wine grape irrigation and crop load management, believes that climate is an important part of terroir. He began by quoting Mark Twain who said, “Climate is what we expect; weather is what we get.” In addition to climate, terroir is made up of many other factors including vineyard design, viticultural practices and soil. However, climate plays the biggest role. Equal in importance to the amount of rainfall is the timing of the precipitation. In Burgundy, rain may occur all through the growing season. In the Santa Lucia Highlands, as in Santa Rita Hills and Santa Maria, rain is pretty much confined to wintertime. Fortunately, for the Santa Lucia Highlands, water resources are plentiful and growers can control precisely the irrigation of their vineyards. Aha! You say, it’s clear to me now. The fact that the temperature in the Santa Lucia Highlands traverses such a narrow range creates ideal climatic conditions for long, slow ripening of fruit, and tremendous flavor development, typically at lower Brix. The longer the vines stay “stoked,” the more slowly and evenly ripening can occur. Vines shut down when they are too warm or too chilly. If the temperature does not fall below 52 degrees at night, there is more ripening happening while the grapes are dozing. In the Santa Lucia Highlands, these small diurnal swings are due to the maritime influence of the Pacific Ocean. The fog and the wind, both daily love letters from the ocean, mitigate temperatures, creating an ideal climate for ripening of Burgundian varietals grown there. Soils make a difference also, says Dr. Cass. (Warning: the following is for the geekiest of pinotphiles only). He feels soils are “the Cinderella of the wine industry.” Many factors affect vine performance and ultimately fruit quality and these can be studied ad infinitum. Speaking to soil, what is it about the dirt that defines the quality of the wine from this region? Simply put, Chualar Loam, of which just under half of the Santa Lucia Highlands AVA finds beneath its feet. This ancient glacial alluvial soil turns out to be very conducive to vines. There is little need for extreme ripping, or digging up of the soil. It is of good quality and rates an 8 out of 10 in a soil ranking scale. The other major soil types in the region are Arroyo Seco, which also rates 8 out of 10, Placentia (7/10), and Gloria Sandy Loam (5/10) which has a significant hard pan. Whatever the dirt, the ability to water the vines here with precise control overrides the exact soil type. The final speaker was Gary Pisoni, the ebullient and charming guy who in his own words “had the first great clone in the first great place that was perfect for growing Pinot Noir.” Like Franscioni, he also comes from generations of farmers who tended row crops long before he was born. Enthusing the positive energy that has made him a household name among Pinot circles, Pisoni recalled how much he enjoyed drinking and collecting fine French wines while in college. When he graduated, he was anxious to find a way into the wine business. When he told his father he wanted to plant grapevines instead of lettuce on the family acreage, he was met with several objections, not the least of which was the cost. Gary countered to his father, “Have you ever been to a $250 lettuce tasting?” His father relented and a legendary vineyard was born. 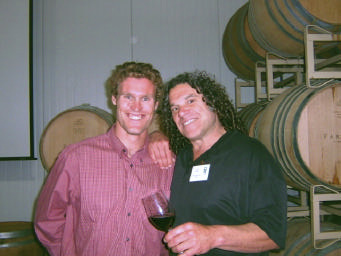 Pisoni concluded by quoting Louis Pasteur who said, “Wine is a most healthful and congenial beverage.” To which Pisoni added his own quote, “Santa Lucia Highlands Pinot is a necessity of life!” (Gary and son Mark Pisoni below). Now Let’s Taste Some Wine! All of that talking and note-taking made people thirsty. The attendees adjourned to a gourmet luncheon hosted by Chris and Claudia Smith of Paraiso Vineyards, prepared by Chef Cal Stamenov of Bernardus Lodge, and accompanied by no small amount of delectable Chardonnays and Pinot Noirs from Paraiso Vineyards. The 2005 Paraiso Estate Pinot Noir ($25) was easy to love with its bright cherry and plum fruit, nice touch of baking spice and sweet oak, and good acidity. The vista from the Smith’s charming and well-decked home sweeps across the entire Salinas Valley, and is crowned by a stunning view of the Pinnacles perched in the blond hills to the east. After lunch, the serious wine tasting began. In all honesty, I have had quite a number of wines from the Santa Lucia Highlands before, and have found some to be a bit over the top in winemaking style. Consequently, I started the tasting with an open mind and will report on the Pinot Noirs that were my favorites. It is hard not to begin with Pisoni. There is something purely magical about the fruit from the Pisoni clone. Reputedly a suitcase clone sourced from cuttings from the Domaine Romanee-Conti Romanee- Conti Vineyard, Pisoni’s vines seem to exude fruit with a very dark soul. We sampled the 2005 Pisoni Garys’ Vineyard Pinot Noir ($40) which was aged in 50% new French oak and fermented with natural yeasts. The big wood aromas were accented by cinnamon and clove, and the flavors of rich and ripe plum and raspberry made this a big wine in the mouth. The acid was very pleasant. Yes, I could drink this one easily. I especially loved the 2005 Pisoni Estate Pinot Noir ($60) which was aged in 60% new French oak. The oak added lovely vanilla notes to the brilliant dark cherry, earth and spice flavors. The finish of licorice and chocolate was pure decadence. A+! I would be happy with a case of this resting in my cellar. (Note: at this point I began to see the dollar correlation between new French oak and the retail price of wine). Pisoni Winery & Vineyards: www.pisonivineyards.com. The 2005 Belle Glos Los Alturas Vineyard Pinot Noir was a blend of 2A.6,9. and some Dijon clones. It was quite earthy and Burgundian in character. Belle Glos: www.belleglos.com. The 2005 Bernardus Rosella’s Vineyard Pinot Noir ($50) had a shy nose, but some wonderful wild berry flavors, especially leaning to the strawberry side of the jam isle. The acidity was satisfying and I gave it a solid A. Bernardus Lodge & Winery: www.bernardus.com. The wines from La Rochelle (formerly Mirassou) were all very distinctive. Winemaker Tom Stutz explained that he is making “wines of place,” that is, seeking out only the very finest and well-managed vineyards that will yield the most distinctive of wines. The 2005 La Rochelle Santa Lucia Highlands Pinot Noir ($42) is a blend of fruit from several vineyards and aged in 40% new oak. The wine is pleasingly spicy and complex with generous fruit and reigned in acidity and tannin. I gave it a B+. Tom said he expected this Pinot to have broad appeal, after all, “Pinot Noir is a fashion business.” The 2005 La Rochelle Sleepy Hollow Vineyards Pinot Noir ($40) is aged in 60% new oak and comes from Block A of Talbott’s vineyard which sits at 700 feet elevation. This wine is big, dense and filled with great blackberry, minty chocolate and spice. It could just be that blackberry pie in a bottle you have been seeking. I gave the wine an A-. The winner in the lineup was the 2005 La Rochelle Sarmento Vineyard Pinot Noir ($45). This comes from a vineyard managed by Rich Smith and partners. The nose is devine and alluring, with “come hither and dig deeper” aromas typically associated with a fine Burgundy. On the palate, it delivers minerality, cherry flavors, a fabulous structure, and a huge, everlasting finish. Another solid A effort. The 2006 vintage will be released this Fall. Also coming from La Rochelle is the 2005 La Rochelle Garys’ Vineyard Pinot Noir. La Rochelle Winery: www.lrwine.com. The 2005 Morgan Tondre Grapefield Pinot Noir ($55) earned a solid A with its rich nose, great promise of long-term aging, and a zesty spiciness to complement the great raspberry and cherry flavors. The complexity, balance, finish and hint of pepper made this a standout. Winemaker and owner Dan Lee has quite a good Pinot Noir lineup. The 2005 Morgan Double L Vineyard Pinot Noir ($59) was earthier with definite hints of root vegetables. Morgan Winery: www.morganwinery.com. Winemaker Tony Craig, owner of Sonnet Wines, was pouring several Pinot Noirs from Tondre Grapefield. 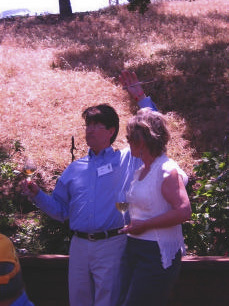 2005 Tondre Grapefield Pinot Noir ($43) is made specifically for owners Joe Tondre and Penny Alarid by Tony. Big, spicy and filled with brambly fruit. I loved the baking spice and slightly peppery core. Grower Joe said the optimal brix for picking Santa Lucia Highlands fruit is between 26 and 27. 2004 was the only year he has seen it picked higher, and by and large, the 2004 vintage was a bit flabby, as an extremely hot August caught many growers and winemakers by surprise. Tondre Grapefiled was planted in 1997 and supplies grapes to multiple producers including Bernardus, Cima Colina, David Bruce, De Tierra, Morgan, Silver Mountain, Sonnet, and Tudor. Tondre Winery & Vineyards: www.tondrewines.com. 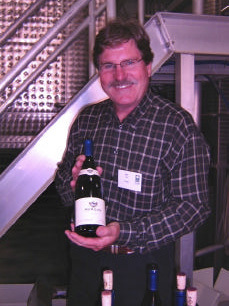 Winemaker David Fleming of Pariaso poured the 2003 Paraiso West Terrace Pinot Noir ($40). This wine was made from the best blocks of the estate vineyard. It sports a very Burgundian nose and delivers big-time on the palate with a wonderful texture that positively fills the mouth. This is a wine for those who like ‘em lush and lavish. Paraiso Vineyards: www.paraisovineyards.com. Bill Brousseau from Testarossa wines was pouring the 2005 Testarossa Sleepy Hollow Vineyard Pinot Noir ($59) and the 2005 Testarossa Garys’ Vineyard Pinot Noir ($59). They both exhibited great spice, which seems to be a recurring theme in Santa Lucia Highlands Pinot Noirs. Testarossa Vineyards: www.testarossa.com. The last wines in the lineup were Gary Franscioni’s Roar label Pinot Noirs. The 2005 Roar Garys’ Vineyard Pinot Noir had a distinctively Burgundian nose, with fascinating notes of violets, lavender and cherries. A pleasant hint of chocolate rounded out this wine. I gave it a B+/A-. The last wine of the day for me was the 2005 Roar Pisoni Vineyard Pinot Noir. I wrote “I LOVE it!” in my notes. This is a big, rich and lush Pinot, with oozing flavors of cherry and blackberry and a solid spicy core. Roar Wines: www.roarwines.com. The Final Word Pisoni Estate released their first Pinot Noir in 1998. At the time, the wine retailer, Marin Wine Cellar, posted a piece on their website about the Pisonis . I was searching to purchase the inaugural vintage back then and kept this article because of its humor and historical significance.. I wanted to excerpt this piece here because it makes good reading. Tucked away above what otherwise would be known as a vast, heavily planted landscape of mixed produce, carved out with great passion and years of hard work by Mr. Pisoni, Sr., whom I should refer to as “Mr. Happily Generous,” because he practically wanted me to take the farm home with me, lies tiny Pisoni Winery. Tiny only describes its case production. The words “big/great” should be used to describe the zest and the gusto with which Gary (son) and Jeff (grandson) envelope you when they talk to you about their venture. I recall with great fondness the time I spent with Gary and Jeff and their parents one day - and a great day it was! Punctuated with great tasting wine, humor, food, and of course good company. While much food was eaten that day, the clear favorite was the venison sausage, served two ways, pan-fried in a sourdough sandwich, and air-dried with cheese. In my travels I have had some fabulous sausages and I have to say unequivocally that these venison sausages were some of the best, if not the best I have ever tasted. What made these sausages so outstanding was that, like all great Italian food, Mama made them. Ahh, Mama Pisoni, the effervescent 76-year-old matriarch who not only made the venison sausage, she bagged the deer herself!! When it was time for me to depart, I hitched a ride with her from the vineyard back to where my car was parked. Now, I know that familiarity with those skinny dirt roads in the foothills enables one to drive a tad faster than normal, but as I sat there in the front passenger seat, I couldn’t help but have sly admiration for her, while I braced myself, as the needle clipped 70 mph at times! Mama Pisoni’s energy is clearly passed on to Gary. You certainly need energy to plant a vineyard the way Gary did - by hand - in an area not known back then to be grape-hospitable. After chowing down at his ranch house (on those delicious venison sausages, etc. ), Gary, Jeff and I shot the breeze and had a blast of a time. When Gary gave me free reign in his cellar, I picked out a few excellent bottles and, well, we just drank ‘em up and continued to have a good time. Gary draws you into a ground swell of genuine hospitality, excitable energy, zest, and a feeling that you’ve known him all your life. After the ‘banquet-size” snack at his house, we moseyed on up to the vineyard where the cave was under construction and where more food was waiting. So to make room, Gary was, uh, shall we say, exercising it off. If you can call front and back flips off a 10-foot dock into a huge pond full of catfish exercise. That’s the kind of energy you can expect from Gary. It’s a good thing that Jeff is around. He is the ying to Gary’s yang. Though young in years, Jeff has had plenty of exposure to the biz. He has worked the vineyard, the crushes, and has been involved in the winemaking to the point where he is now the winemaker. He is most definitely enjoying his job, and who wouldn’t if you can work with the kind of fruit they have? The grapes have long been known to produce great wine; no wonder the likes of Peter Michael, Flowers, Miner Family, Patz and Hall and a slew of others crave these grapes. Now what is that makes the grapes so good? LOCATION (foothills), LOCATION (soil), and LOCATION (France). France? But of course, mon ami. The Wine Spectator ran an article in 1999 on Pisoni. In the article it was mentioned that the vineyard is planted with La Tache cuttings grafted onto other rootstock. The article tells of the ‘colorful’ way Gary got them back here. But that only tells half the story. While all those other wineries are clamoring for that fruit, it is Pisoni’s own section of the vineyard that is truly the gem. And why is that, you ask? Because in this section he didn’t graft them onto some obscure rootstock. He took those La Tache cuttings and stuck them in the ground and they took to the soil and grew. So what he now has is La Tache cuttings on its own rootstock! Own-rooted La Tache, you can’t get much better than that. It is this fruit that goes into the Pisoni Estate Pinot Noir. A scant 130 cases were released of the 1998 debut vintage ($149 on the secondary market at the time). It was said to be absolutely delicious with a depth one rarely finds in California Pinot Noir. The 14.1% alcohol was referred to as “heady,” but relative to today’s standards, that alcohol level was quite modest. The 2004 harvest offered 643 cases of Pisoni Estate Pinot Noir ($65) which were sold in 3- and 6-packs to eager consumers lucky enough to be on the mailing list. The website is www.pisonivineyards.com. Jeff Pisoni is considered one of the hottest young winemakers in California, and Gary’s other son, Mark, is the winery’s talented business manager-grape grower. 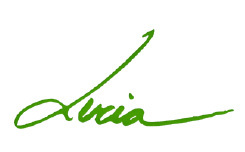 A second label, Lucia, debuted in 2000: www.luciavineyards.com. Are you ready for some Pinot? How about 170+ producers and over 400 Pinot Noirs? Betcha can’t just taste 50. The Pinot Days event is held at Fort Mason in San Francisco, June 29-July 1, 2007. Want to learn more about the Santa Lucia Highlands? 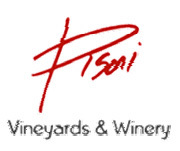 On Saturday, June 30, there will be a comparison tasting of Pinot Noirs from Pisoni and Rosella’s Vineyards ($80). On Sunday, July 1, there will be a diverse menu of tasting seminars to choose from, including an appellation study on the Santa Lucia Highlands ($80). The seminars are followed by the Grand Festival Tasting. On Friday, June 29, there is a fancy Winemaker’s Dinner and Auction ($150). Total Pinot immersion for those who are up to it. Tickets are available at www.pinotdays.com. Last year’s event was nearly a sell out so don’t procrastinate. The Prince will be hanging out at the Grape Radio booth so stop by and talk some Pinot. You aren’t a phile if you haven’t indulged in Noir at Pinot Days.